Cross country running is the ideal sport to enjoy in the British countryside. Making the most of hills, woodlands, grass, mud and puddles, runners compete to complete a long distance course over varied terrain. Events typically take place in the autumn and winter, when the grass, fields and woodland are soft under foot. Whilst cross country running is traditionally a competitive sport, it can be enjoyed at leisure by anyone who is keen on both running and the countryside. Indeed, it is useful for prospective cross country runners to practise in rural areas before entering a race. Runners will need to be equipped with a quality pair of trainers or running shoes. Many brands sell shoes specifically designed for cross country running, in styles which offer a good level of support, whilst being lightweight and breathable. Some styles are also fitted with spikes. Even in freezing conditions, runners typically wear a vest and shorts in a breathable sports fabric. Runners pin their race numbers, printed on paper, to the front of their vests. When racing, it is always advisable to take along five or six small safety pins for this purpose. Traditionally, thick woollen running socks were worn for cross country races. Nowadays, sports socks are often preferred. Female runners will need to invest in a well-fitting sports bra. Some retailers advise runners to opt for a sports bra one cup size smaller than usual, to ensure maximum support. Whether racing or not, it is of vital importance that cross country runners pay close attention to the terrain they are crossing. Uneven, slippery surfaces can prove hazardous and it is important to tread carefully in order to avoid accidents. Indeed, falling will also slow a runner’s race progress. Runners can receive cuts and bruises from vegetation or from falling on hard ground. Be sure to attend to all such injuries carefully at the end of the race. Take along a first aid kit for this purpose. Runners should be particularly careful on rainy or snowy days. Remember that these weather conditions can obstruct your vision. Frozen terrain can be a safety hazard too, so stay alert on cold days. Whilst it is possible to compete in cross country running purely for fun, training regularly will help you to get the most out of the sport. Running a distance of 5 km to 10 km twice a week is a good start. Opt for uneven, hilled terrain if possible. 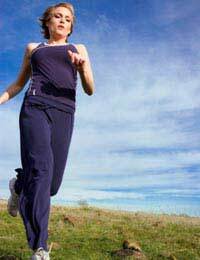 Fartlek or interval training will also be of use. This involves mixing up short periods of sprinting, running, jogging and walking over one session, working towards longer periods of sprinting and shorter periods of walking and jogging by the end of the session. Maximise interval training sessions by incorporating hills and slopes into your workout. Runners can also benefit from strength training exercises. Squat jumps are a great example of this. Squat, legs bent, then jump up and land tall. Initially, repeat this exercise around 15 times and aim for 2 or 3 sets in one session. Aim to increase the numbers of repetitions and sets over time. Races are started in masses, with a gun or a horn. Each individual runner is responsible for staying within a path marked out by flags, chalk, ribbons, paint or cones. Runners are not permitted physical contact with each other whilst running. Courses end at a finish line, which closes with a funnel or chute. This is a marked walkway that keeps runners in single-file, so that their finishing places can be accurately documented. Cross country running is a truly exhilarating sport and one that makes thorough use of the rural landscape. Whilst all runners compete to finish first, running for a team can prove a motivating and memorable experience. Put your endurance to the test, face the mud and give cross country running a go.